I can remember the first time I tried a Mexican Wedding Cake cookie. If I remember correctly, my mom was baking holiday cookies and got the recipe for them from one of our neighbors. I was an instant fan. 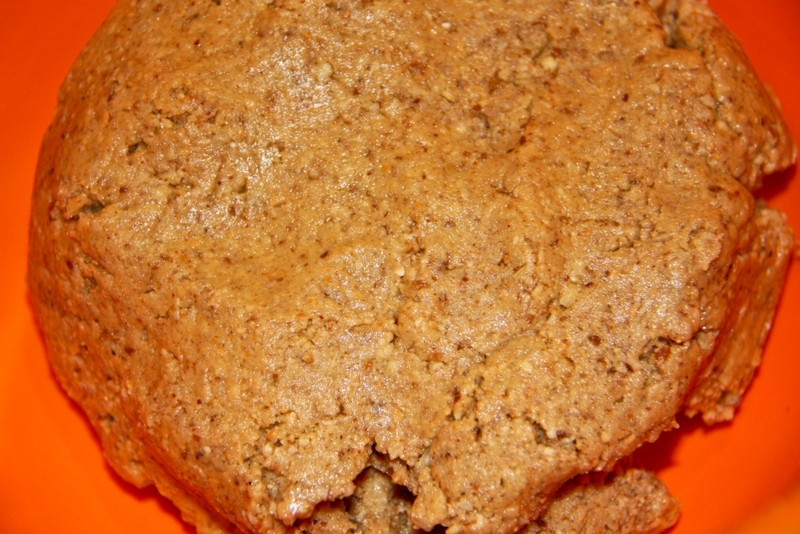 I loved the intensely pecan flavor of this cookie and its sugar-coating. 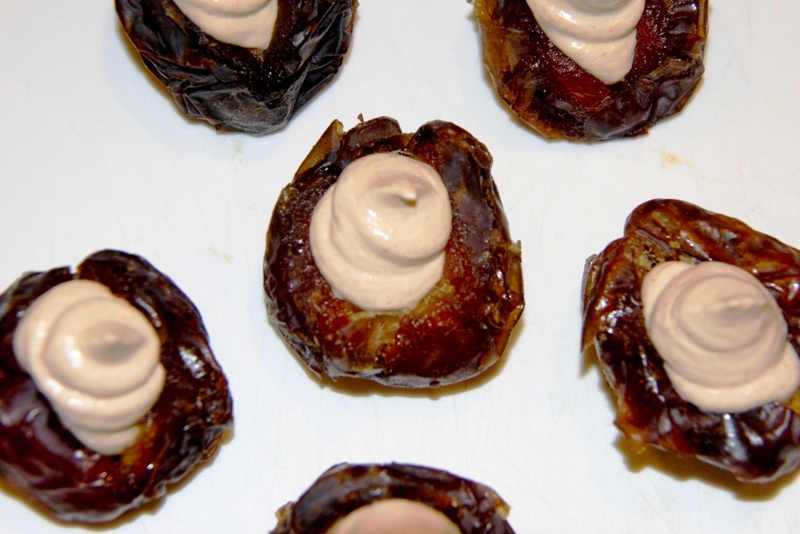 I recently held a vegan cooking (although there was no “cooking” involved) demonstration as part of NEXT Week. I am a Brand Ambassador for NEXT by Athena and the company put on a great event. During NEXT week there were tons of free classes held at the Swimspot store at the Irvine Spectrum… everything from pilates, yoga, Pure Barre classes, to my cooking demonstration. I decided to keep the cooking demonstration easy and made three varieties of my Cookie Dough Bites; PB and C Cookie Dough Bites (click here for the recipe), Mexican Wedding Cake Bites, and Gingerbread Bites. My kids love my cookie dough bites. 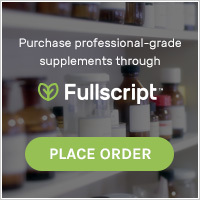 Most everyone I know likes to have something sweet from time to time and these are great for those occasions because there really isn’t anything in them that is too “bad.” Yes, you do want to make sure you don’t get too much fat in your diet, but I would MUCH rather have the fat in your diet come from nut butters than animal products. 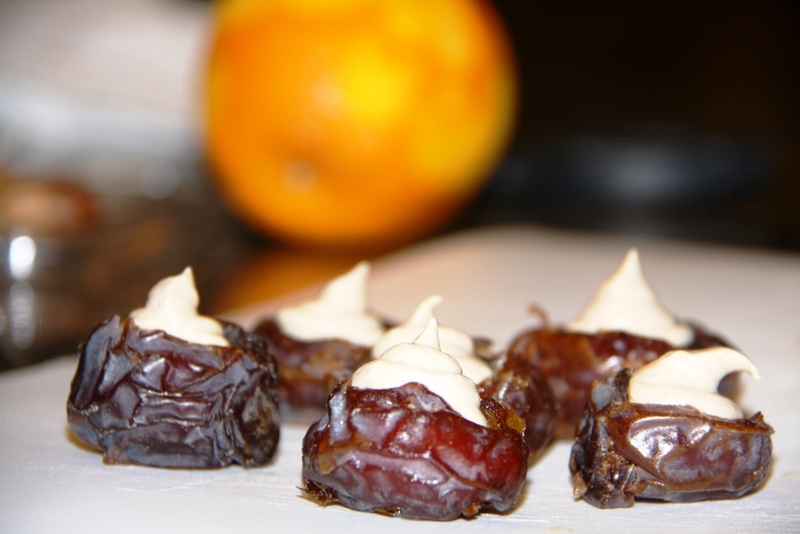 While my version of these Cookie Dough Bites does not have the traditional powdered sugar-coating, you could definitely opt to do so. Falling back on my simple is best philosophy, these are crazy easy to make and come together in a snap. ***DO NOT use vanilla extract. 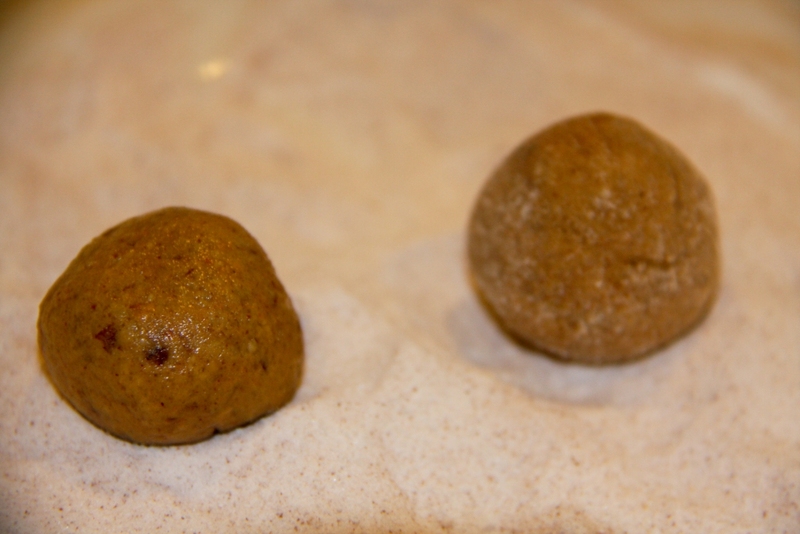 Since these are not cooked, the alcohol in the extract won’t taste good. 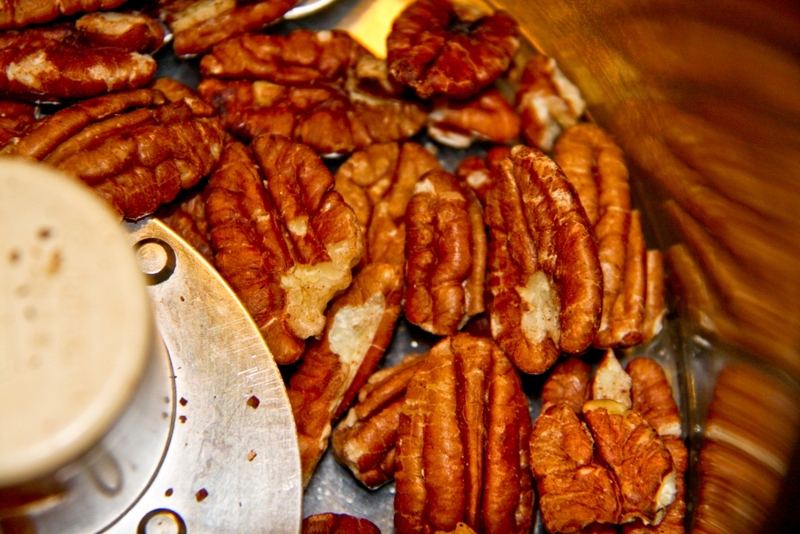 On the stove over medium-low, toast the pecans (watch carefully to prevent burning). Once tasted, remove them to cool. 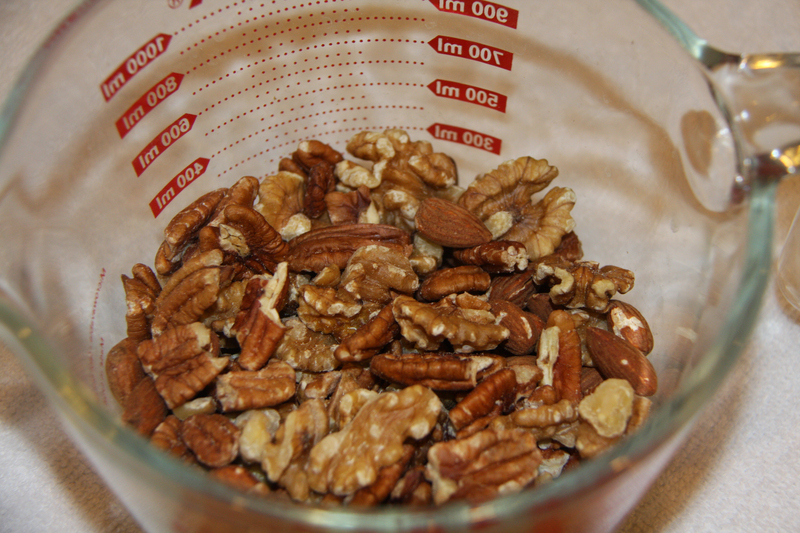 Place the cooled toasted pecans in the food processor and process into a meal. With a hand blender, cream together the cashew butter, ½ cup Somersweet and vanilla flavor. 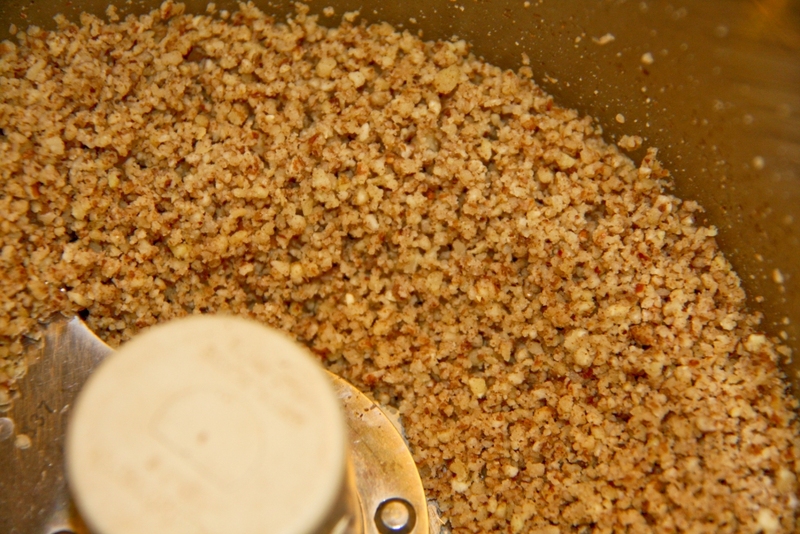 Once the mixture is creamed, mix in the toasted pecan meal (I use my hands). 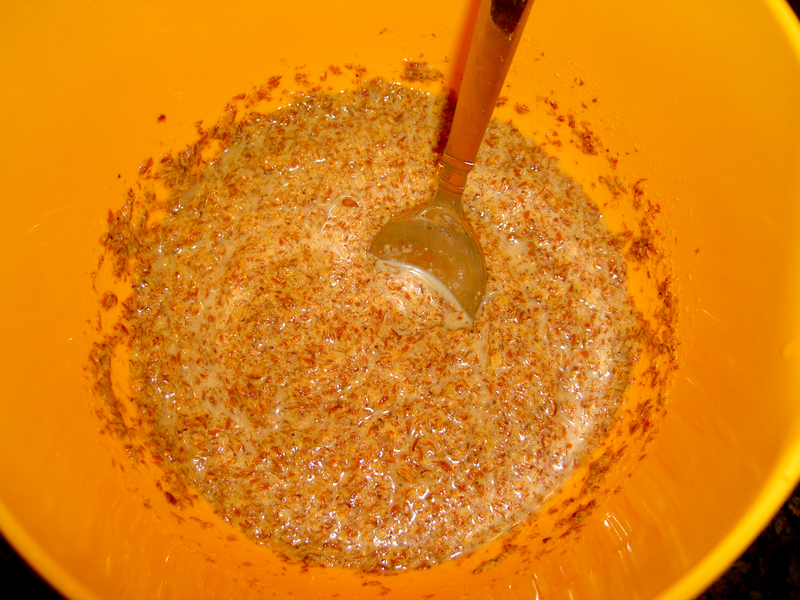 Once the mixture is creamed, mix in the toasted pecan meal (I use my hands while wearing non-latex gloves I bought at Costco). Form the dough into small rounds (about 1Tbs. each). 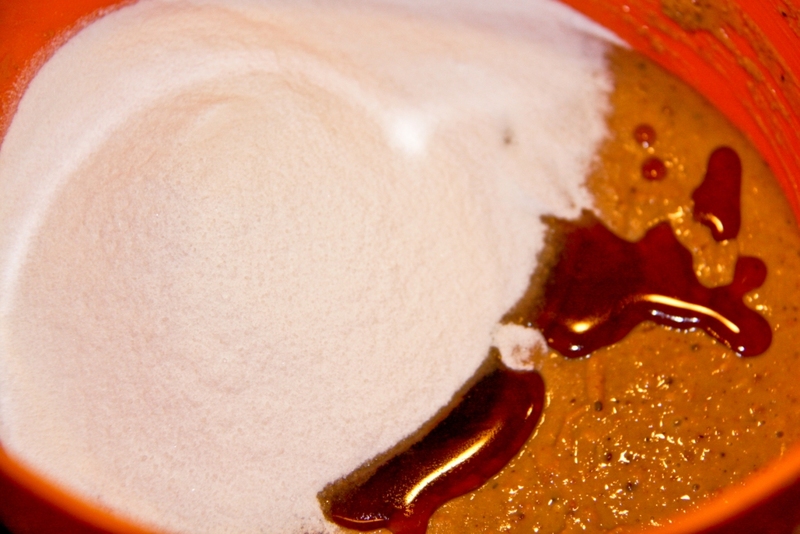 In a separate bowl, combine ¼ cup Somersweet with ¼ tsp. cinnamon. Roll the rounds in the cinnamon/sugar mixture. 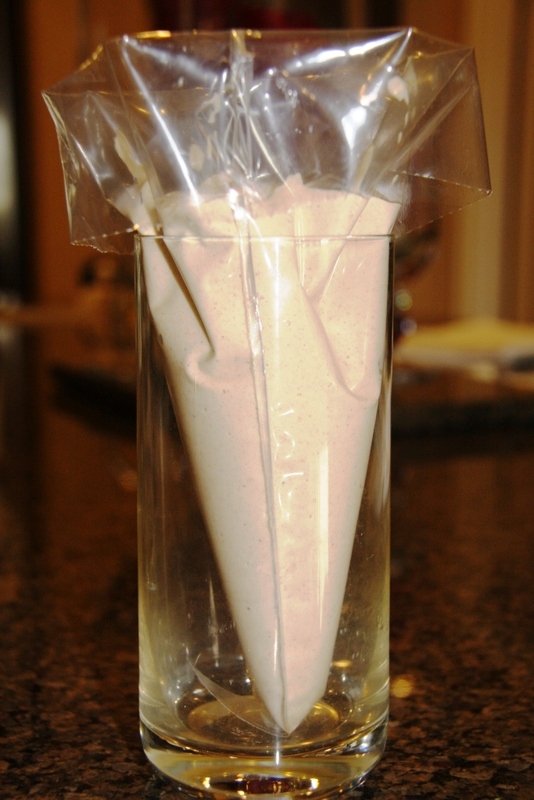 Place in an airtight container in the refrigerator to firm-up. 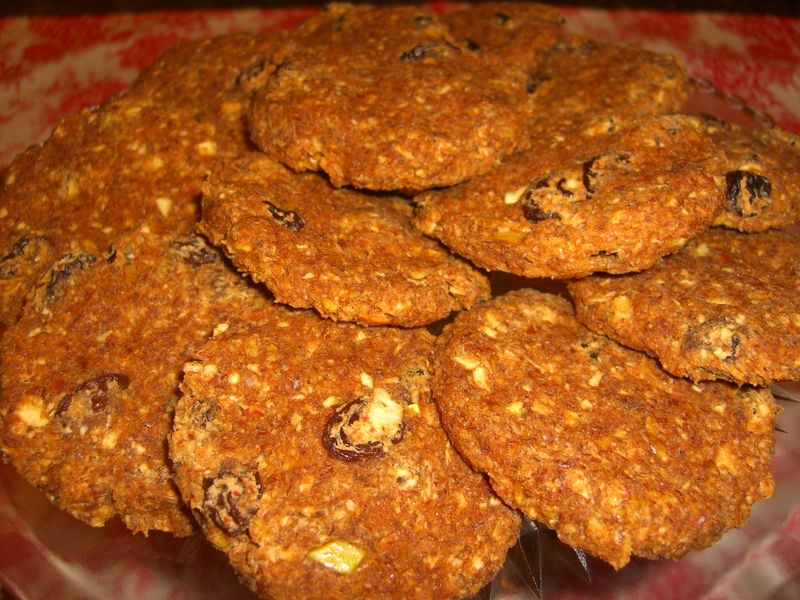 The cookies should keep in the fridge for a week. 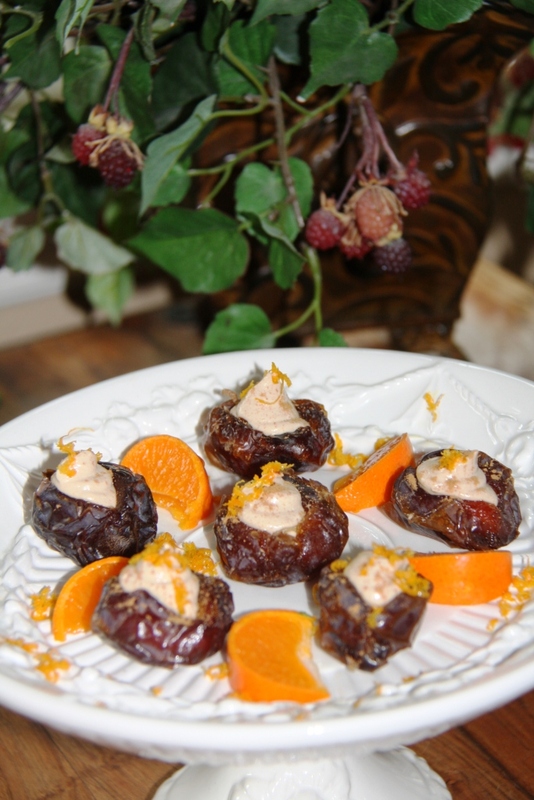 I am always looking for healthy snack alternatives for my family. 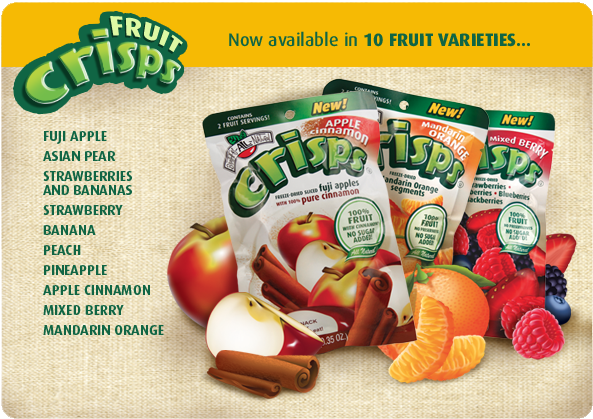 My children really love whole fruit on it’s own, but there are times when I want to send them to school with a chip alternative and these snacks serve that purpose. My kids and husband love these. What I love about them is their simplicity. 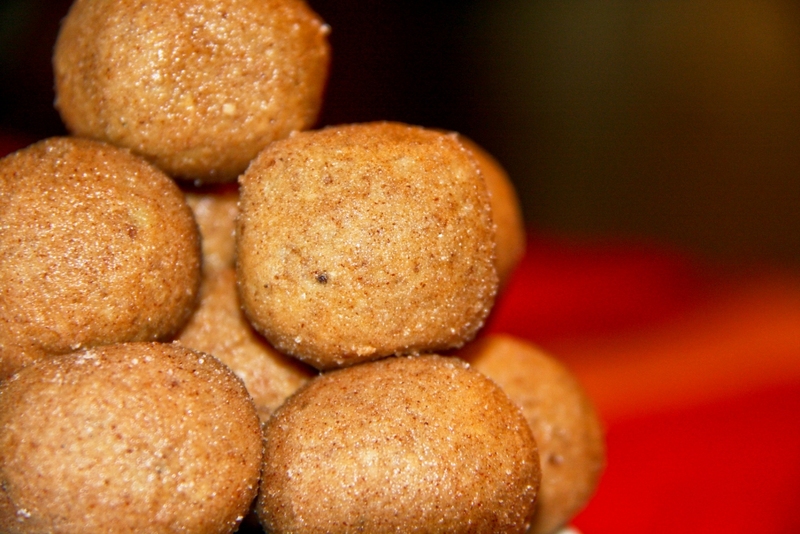 The apple cinnamon snacks are made with just that…apple and cinnamon. I do wish that they offered more organic fruit crisps, but they do offer one, organic strawberry. I just picked-up a pack of mixed freeze dried fruit snacks at Costco today. My daughter was with me and saw them as we were doing our shopping, so we stocked-up again. For more information about Brother’s All Natural click here. One word of caution…I do not endorse buying their potato crisps because the sodium content is WAY too high! Quarter the apples and remove the core. 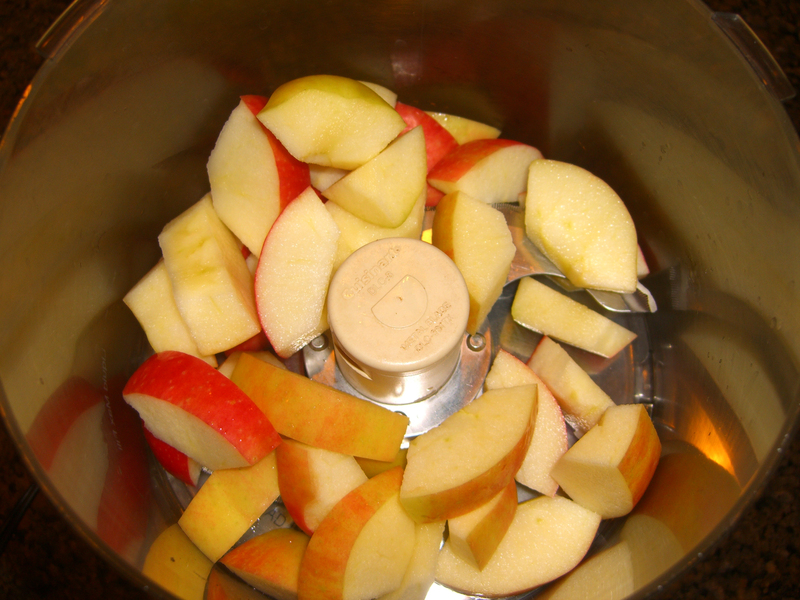 Cut the apple quarters in thirds and place them in the food processor to turn it into raw applesauce. You may need to stop occasionally and scrape down the sides. 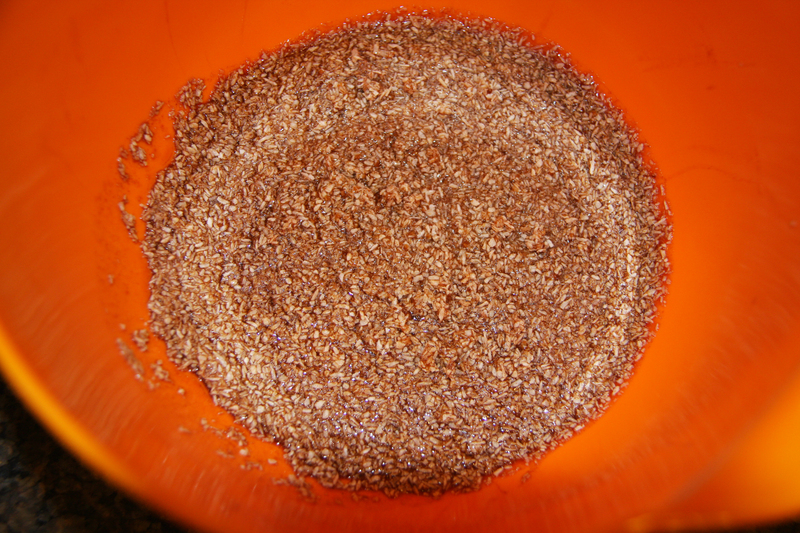 In a small bowl combine the flax meal and water. 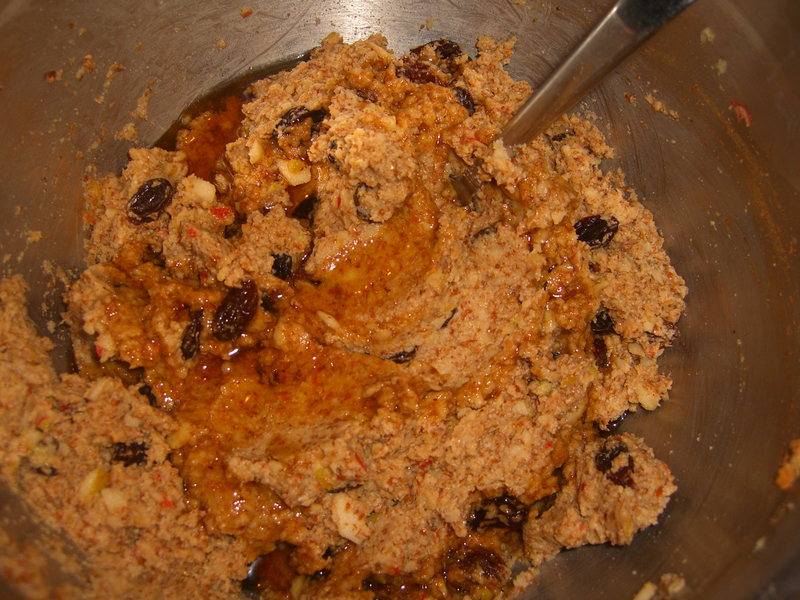 Allow this mixture to sit and congeal (this is what will bind the scones together). 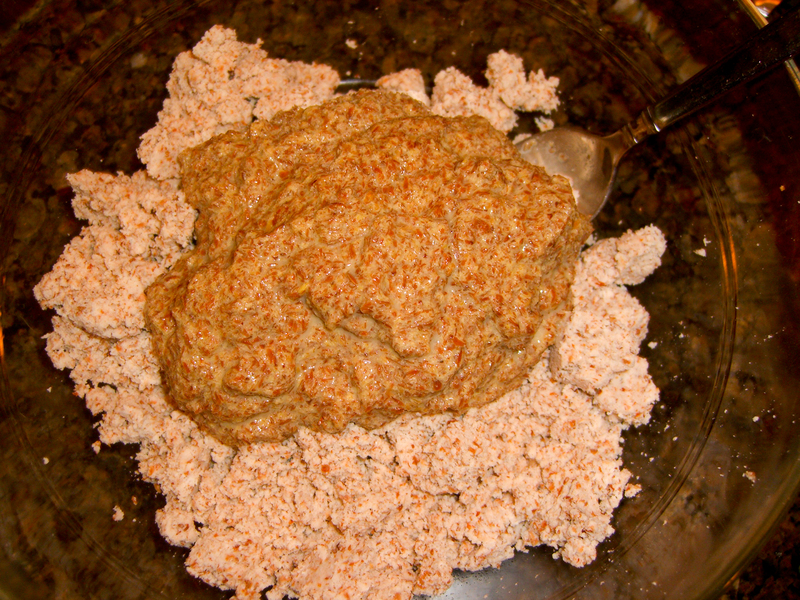 In a large bowl combine the almond pulp and flax mixture. Mix thoroughly. 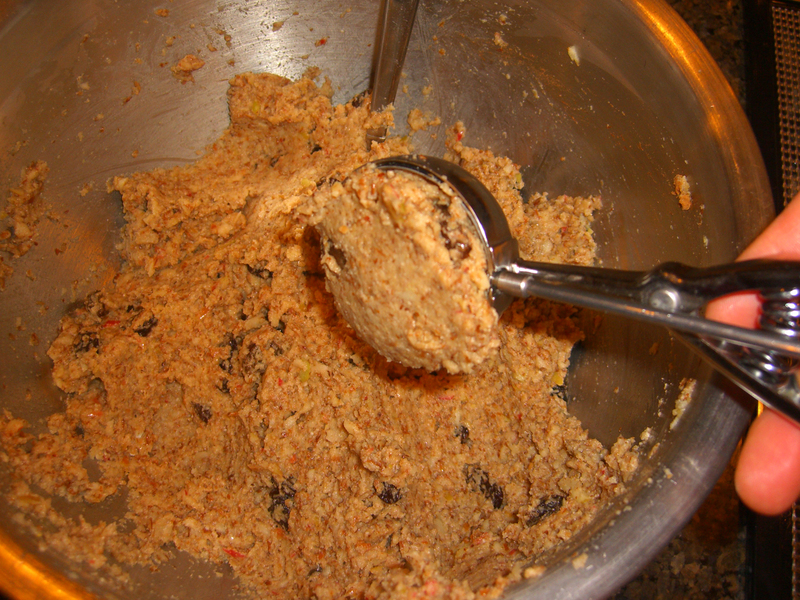 Add the applesauce to the above mixture and mix well. 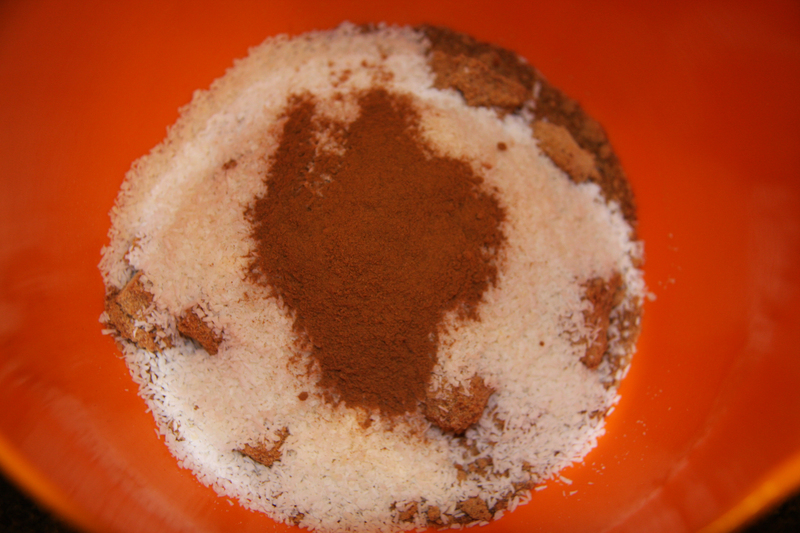 Now add the cinnamon, coconut sugar, maple syrup, and raisons. Mix thoroughly. 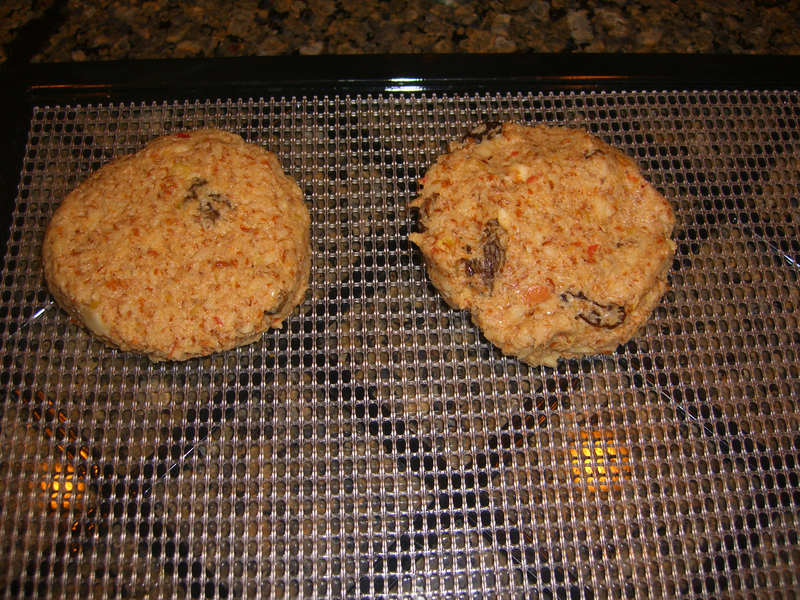 Measure out 1/3 cup of the batter and form it into a scone (I use a large ice cream scoop). 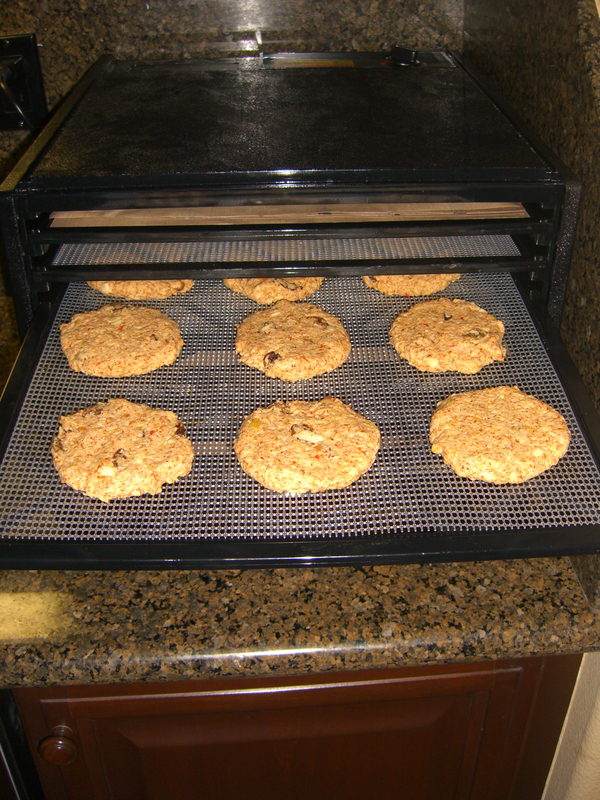 Place the scone on the mesh sheet of your dehydrator. Do the same with the remainder of the batter. Dehydrate at 140° for 2 hours. After 2 hours flip over the scones and then turn the dehydrator down to 115°. 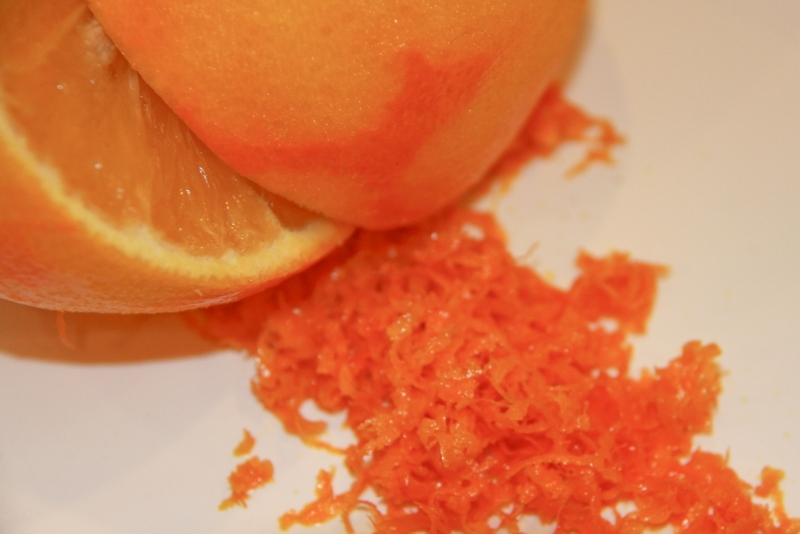 Dehydrate for 3-4 hours more. I keep the scones in the freezer…they defrost fast. 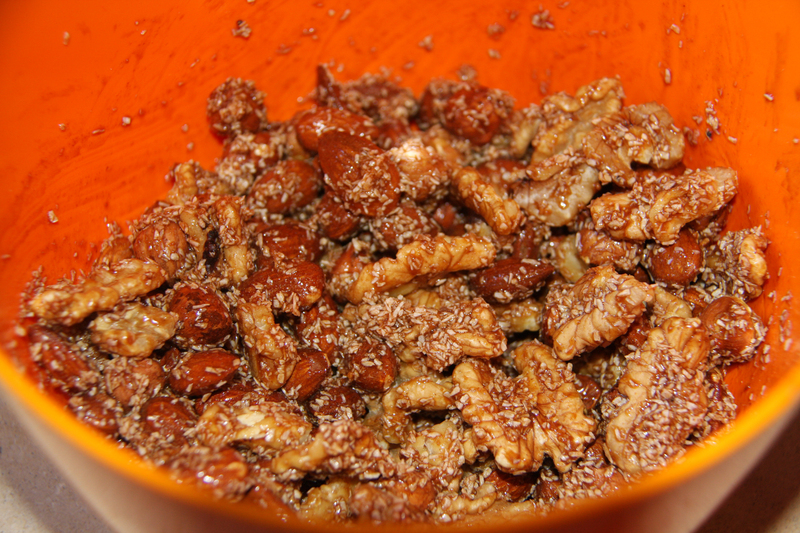 These are the candied nuts that I use in my kale salad recipe. The other night I ran out of candied nuts and put roasted nuts in the kale salad we were having with dinner…my family made it very clear to me that the candied nuts are an integral part of the kale salad! 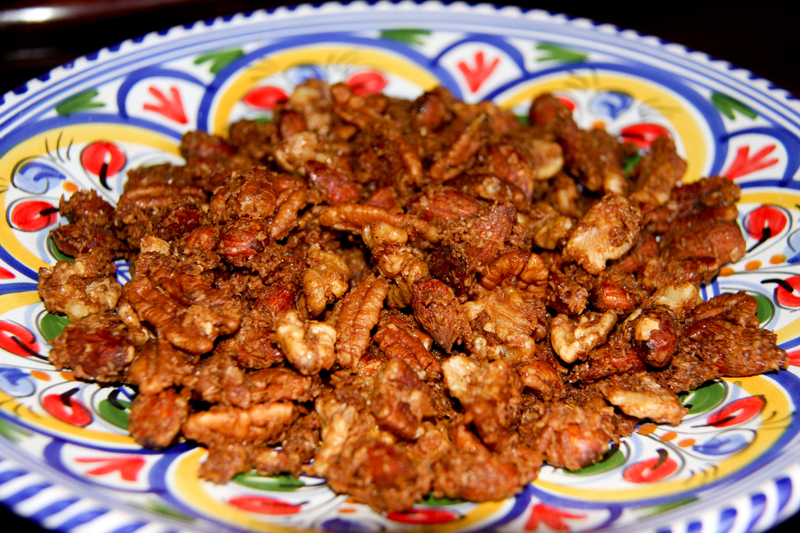 So, today I needed to make some more candied nuts. First measure out the raw nuts. 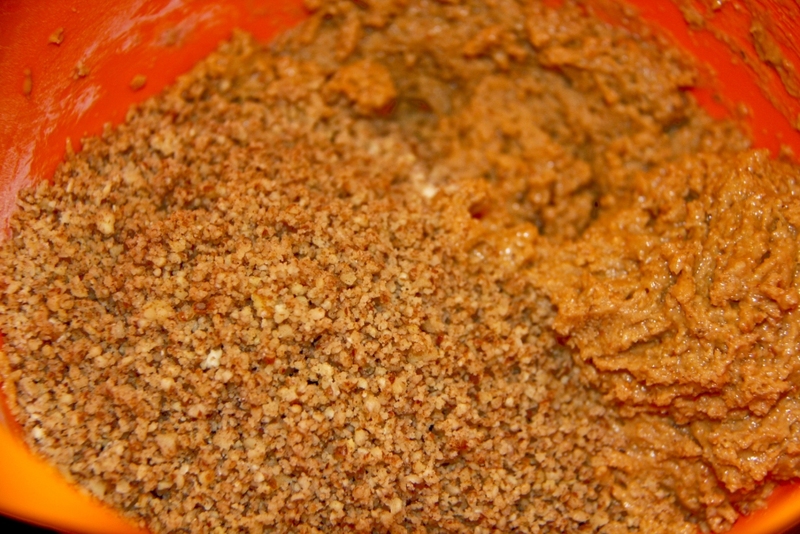 In a separate bowl put the coconut sugar, shredded coconut, cinnamon, and water. Mix well. 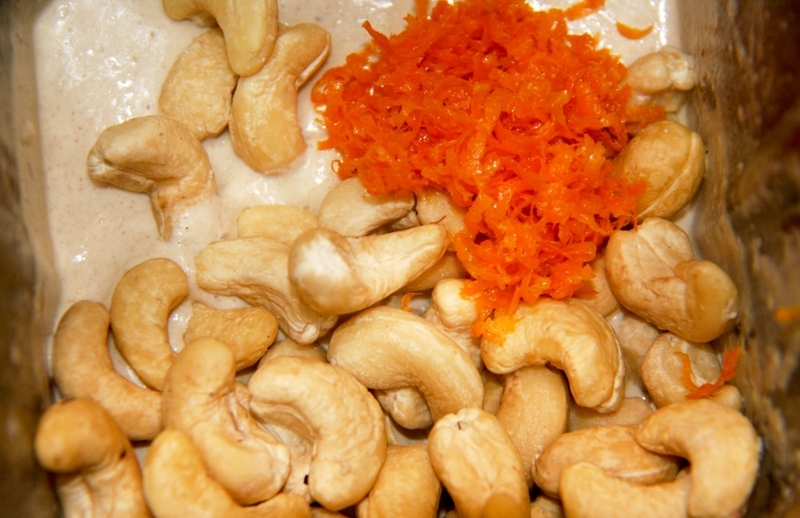 Combine the sweet coating with the raw nuts. Mix well to coat. 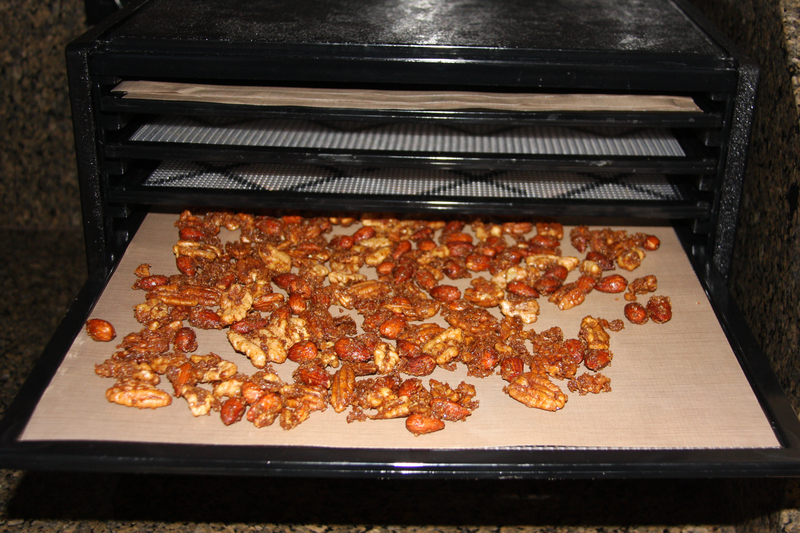 Place the nuts on either a cookie sheet (I also use a silpat) or on a dehydrator tray with a ParaFlexx lining. If you plan on baking the nuts, put them in the oven at 200 degrees. You will need to watch the nuts carefully to make sure they do not burn. 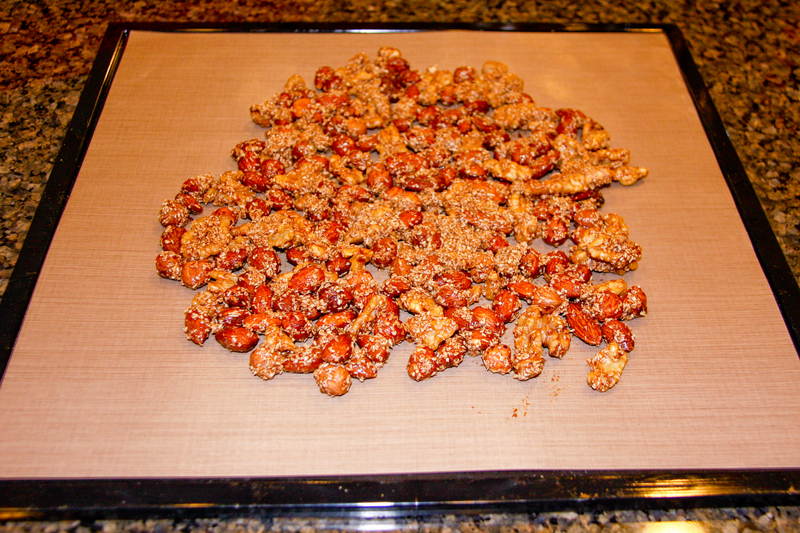 The candied nuts will be done when the coating is no longer wet. When you take them out of the oven to cool they will harden. 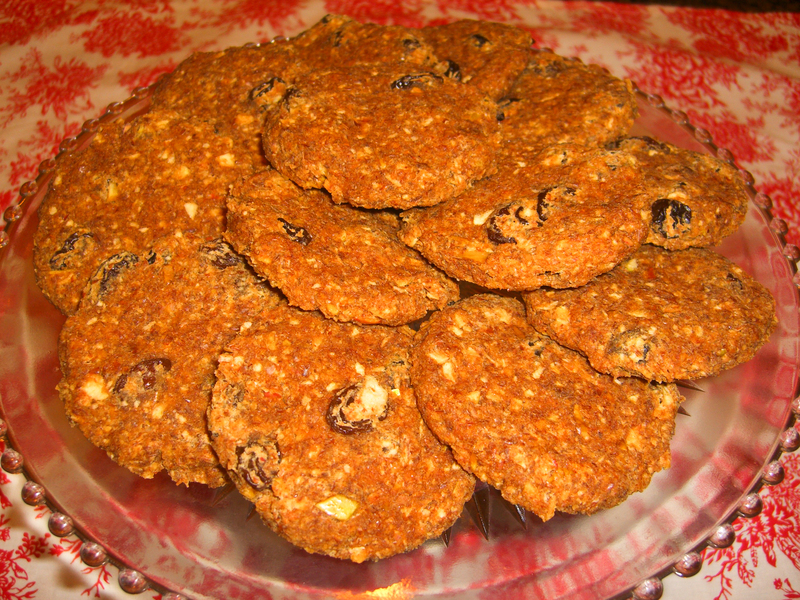 If they are not crunchy enough for you, return them to the oven for some additional baking time. 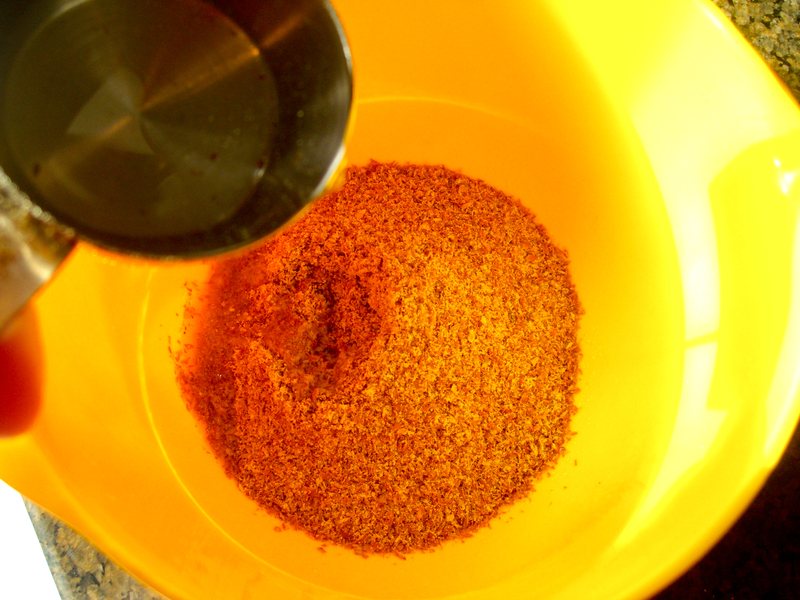 If you will be using the dehydrator (I used my Excalibur), put the tray of nuts in the dehydrator at 115 degrees for 8-10 hours. Check the nuts after about 3-4 hours, take them off of the Paraflexx, and place them directly on the Polyscreen tray. 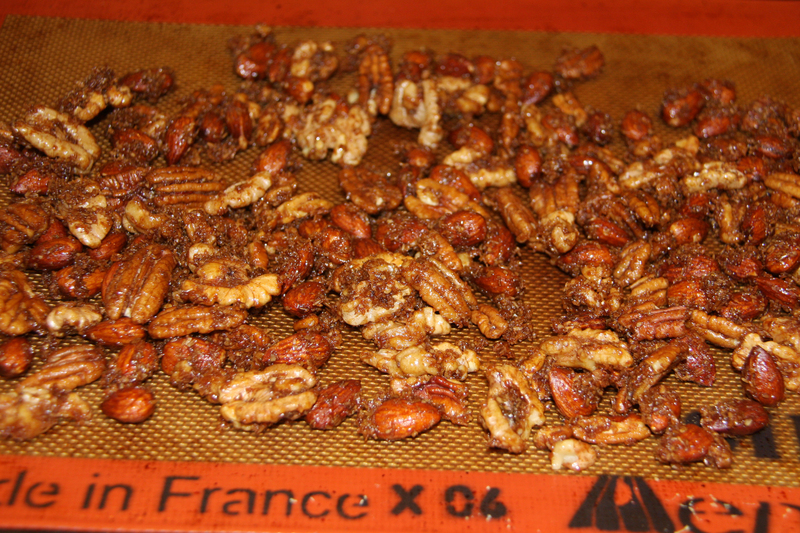 Once you remove the nuts from the dehydrator they will crisp as they cool. 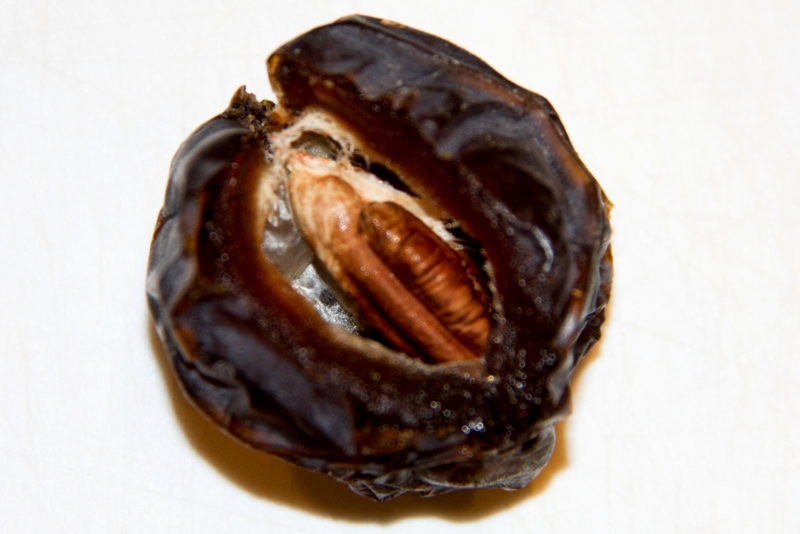 When the nuts have cooled, put them in a bag and store them in the freezer. 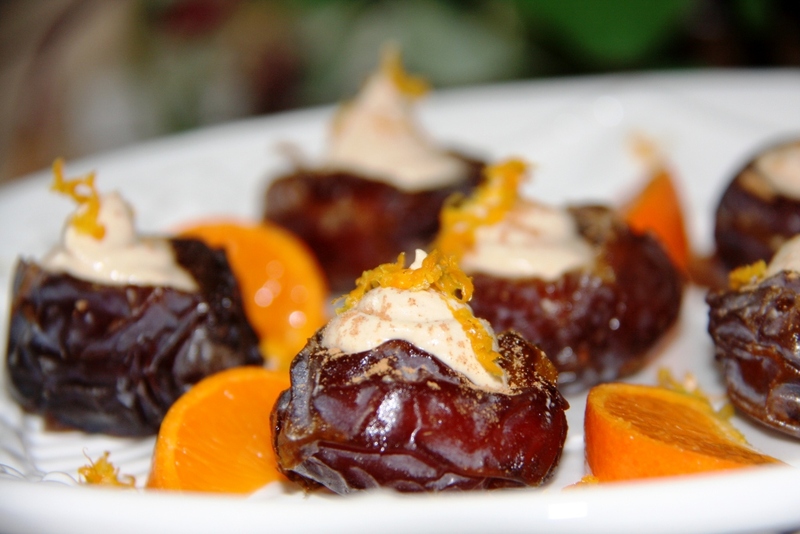 This recipe is sure to be a big hit with your family. My kids claim that it tastes just like apple pie. 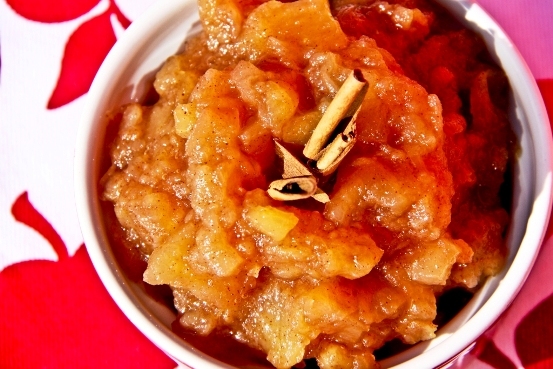 My favorite thing about this applesauce recipe is its simplicity…2 ingredients! 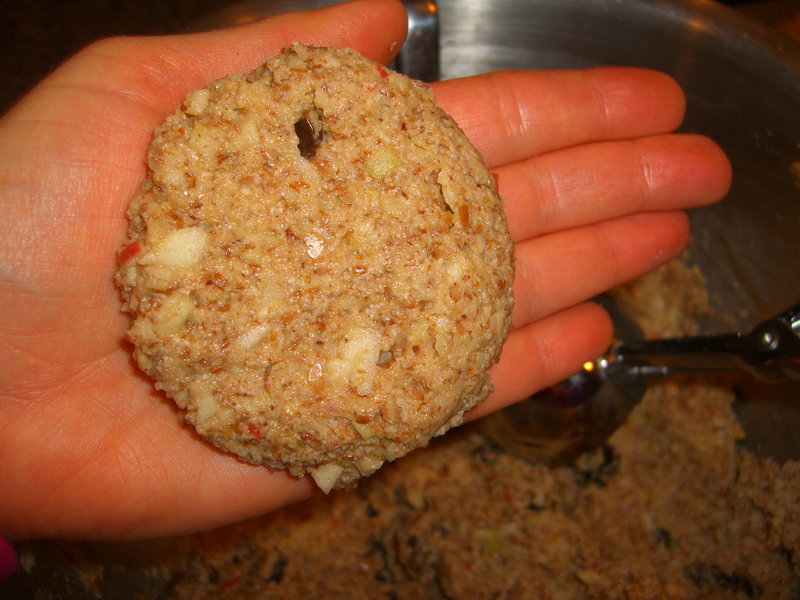 I use 6 pounds of apples whenever I make this recipe because I figure if I am going to make it I might as well make a bunch, but you can easily make a smaller batch. 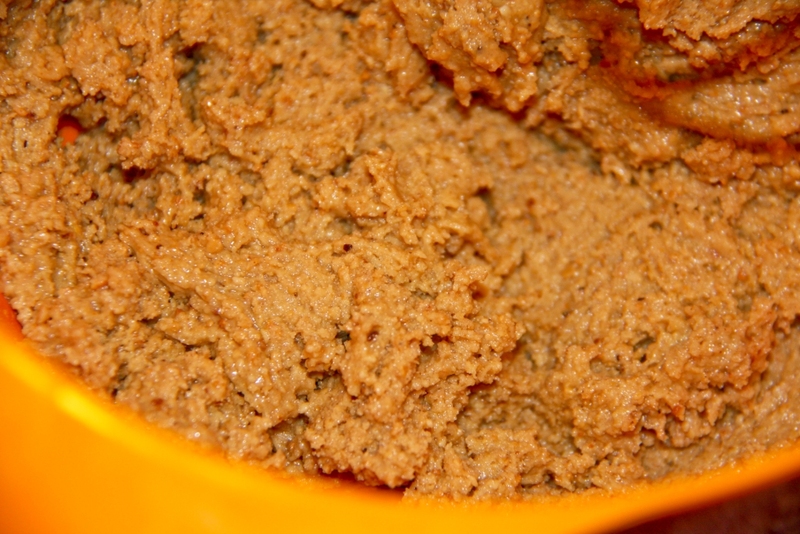 When I make this recipe I put some of the applesauce in the refrigerator and I vacuum pack the rest of it with my Foodsaver (that I bought at Costco years ago) and put it in the freezer. Peel the apples, quarter them, and remove the core. 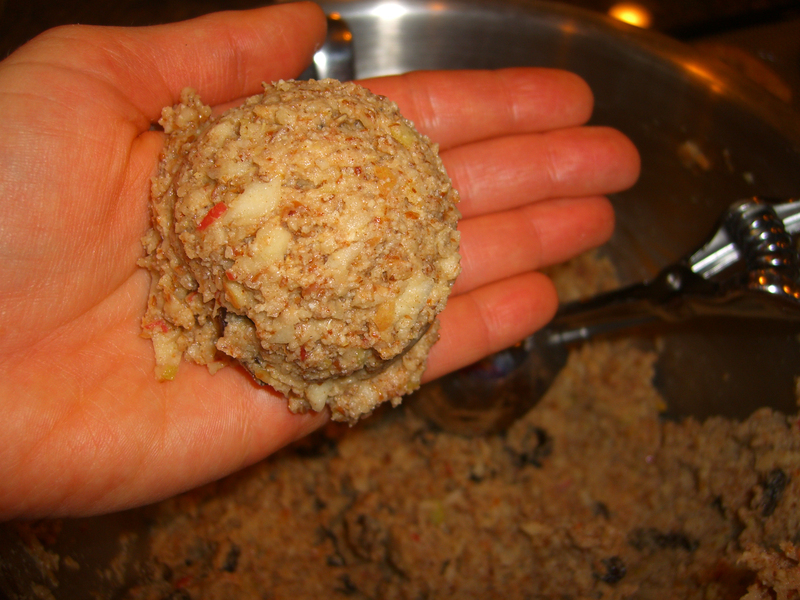 Dice the quartered apples into 3-4 pieces each. 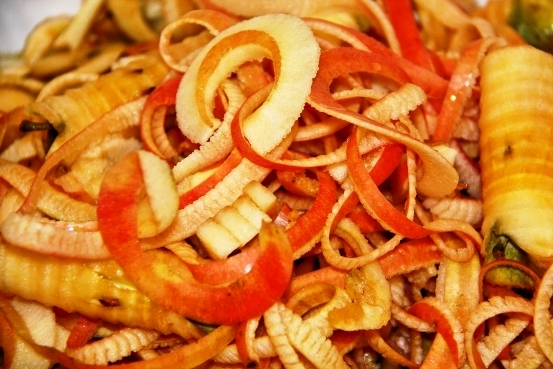 I make this whole process even easier by using apple peeler/corer like THIS one and then quartering the peeled and sliced apple. 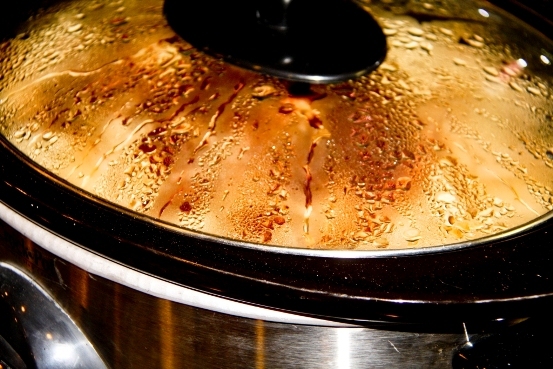 Place the apple pieces into the crock pot. 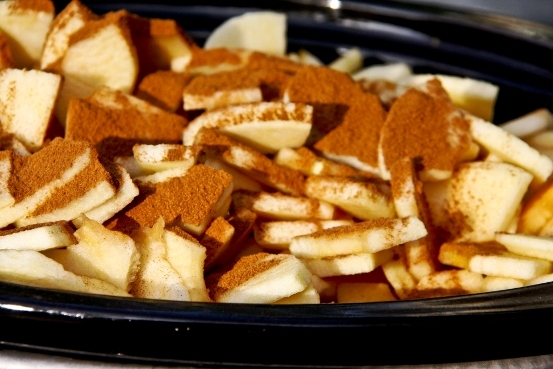 Sprinkle desired amount of cinnamon onto the apples (I use about 2 Tbs.). Cook on high for 4 hours or low for about 6. 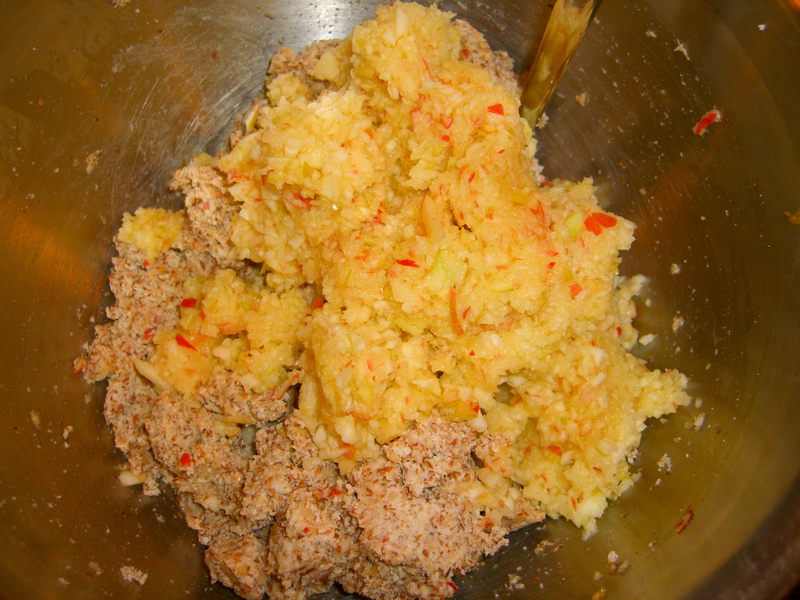 Once the apples are tender, mash them until the applesauce reaches the texture you prefer (we like it a bit chunky). 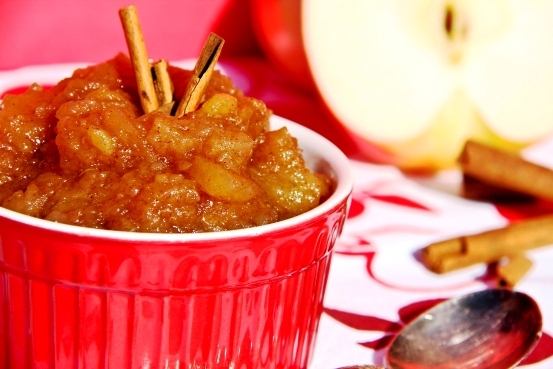 This applesaucee is good on its own either warm or cold. 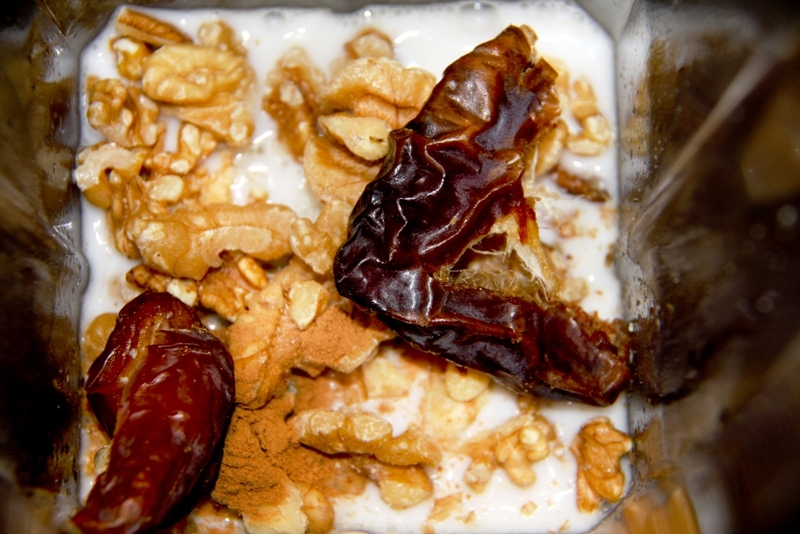 I personally love to have it for dessert with granola sprinkled on top (click HERE for one of my favorite granola recipes)!! !